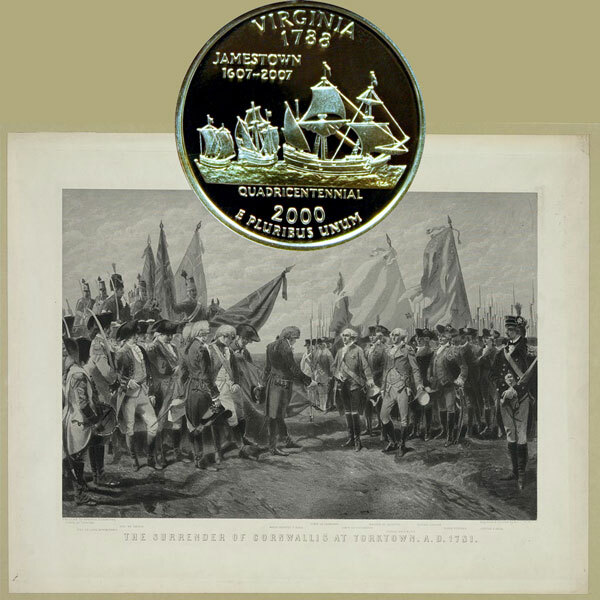 Today, the Virginia State Quarter Coin remembers the arrival of Cornwallis in Petersburg, Virginia 234 years ago, his occupation of Virginia then his surrender just a few months later. Volume 5 of the History for Ready Reference published in 1895 provided insights into the invasion of Virginia by the British and the defense by the Americans and the French. To cooperate with these French vessels, Washington detached 1,200 light infantry from the main army, and placed them under the command of LaFayette. That officer was particularly chosen for this important trust, because the confidence reposed in him by both the American and French troops made him, in Washington’s opinion, the fittest person to conduct a combined expedition. LaFayette moved rapidly southward, to Annapolis; but, the cooperating movement of the French fleet having, meantime, been frustrated by an attack from the English squadron, his instructions required him to abandon the expedition and return. He had already set his troops in motion northward when different instructions reached him. Two more British regiments had been sent to Virginia, under General Philips, who now took command of all the forces there, and this had increased the anxiety of Washington. The situation of the Southern States had become extremely perilous. General Greene had all he could do to fight Lord Cornwallis’s superior force in North Carolina. Unless a vigorous opposition could be made to Philips, he would have no difficulty in dispersing the militia of Virginia, and in effecting a junction with Cornwallis. With their forces so combined, the British would be masters in the South. Washington at once determined to place the defense of Virginia in LaFayette’s hands. LaFayette marched with such rapidity that he reached Richmond, where there were valuable stores to be protected, a day in advance of General Philips. From his post on the heights of the town he saw the British set fire to the tobacco warehouses at Manchester, just across the river, but there were neither men nor boats enough to make an attack possible. Philips, on his part, was too much impressed with the show of strength made by the Americans to prosecute his plans on Richmond, and retreating down the James river, burning and laying waste as he went, he camped at Hog Island. LaFayette followed, harassing the enemy’s rear, as far as the Chickahominy. Here the situation underwent a considerable change. Lord Cornwallis, after his long and unsuccessful campaign against Greene in North Carolina, made up his mind that his exhausting labors there would prove unprofitable until Virginia should be subjugated. His men were worn out with incessant marching and fighting, while no substantial advantage had been gained. Hearing that General Greene had marched to attack Lord Rawdon at Camden in South Carolina, he determined to join Philips. That officer, accordingly, received orders while at Hog Island to take possession of Petersburg and there await Cornwallis’s arrival. On the 13th of May, General Philips died at Petersburg of a fever. Cornwallis arrived at Petersburg on the 20th of May. His forces now amounted to over 5,000 men, which number was soon increased to 8,000. On the 24th of May, Cornwallis, having rested his troops, marched from Petersburg, and endeavored to engage the American forces. But LaFayette, having removed the military stores from Richmond, retreated across the Chickahominy to Fredericksburg, where he expected to meet General Wayne and a battalion of Pennsylvania troops, without whose assistance he could not venture any fighting. Cornwallis moved between LaFayette and the town of Albemarle, where had been placed a great part of the military stores from Richmond, which now seemed doomed to destruction. But on the 10th of June LaFayette had received his expected re-enforcement of Wayne’s Pennsylvanians, and thus strengthened felt able to assume the offensive. Rapidly crossing the Rapidan he approached close to the British army which blocked the road to Albemarle. Nothing could have better suited Cornwallis, who prepared for a conflict in which he felt sure of a decisive victory. LaFayette, however, had not lost sight of the vital feature of his campaign, — to protect the property of the State without losing his army. Through his scouts he discovered an old unused road to Albemarle, unknown to the enemy. While Cornwallis was preparing for battle, he had the road cleared, and under cover of the night marched his men through it and took up a strong position before the town. There he was joined by militia from the neighboring mountains, and he showed so strong a front that the British commander did not venture an attack. The British commander, so far foiled in his objects, had to march back to Richmond and thence to Williamsburg, near the coast, thus practically abandoning control over any part of Virginia except where naval forces gave possession. LaFayette effected a junction with Baron Steuben on the 18th of June, and thus increased his force to about four thousand men. The Americans had now become the pursuers instead of the pursued, and followed the British, harassing their rear and flanks. There now came a pause in the Virginia Campaign, at least in daily operations and excitements. The State north of the James was relieved. Cornwallis crossed to the south side, at Cobham, on the 7th [July]; and LaFayette, retiring up the river, encamped, about the 20th. on the now historic Malvern Hill, then described as one of the healthiest and best watered spots in the State. The entire British army was soon after concentrated at Portsmouth, and preparations made to transport a considerable portion of it to New York. LaFayette, meanwhile, at Malvern Hill, could only await developments. He thought of sending re-enforcements to Greene, and asked Washington if, in case Cornwallis left Virginia, he might not return to the Northern army. But while the marquis and Washington and Greene were speculating on the future movements of Cornwallis and were persuaded, from embarkations at Portsmouth, that he was to be deprived of a large part of his force by Clinton, unexpected intelligence came to hand. Instead of any part going to New York, the British force suddenly made its appearance, during the first days in August, at Yorktown, on the Virginia peninsula, which it had abandoned but three weeks before. Here again was a new situation. Cornwallis, at last, at Yorktown — the spot he was not to leave except as a prisoner of war. Why he went there is a simple explanation. Clinton decided, upon certain dissenting opinions expressed by Cornwallis respecting the situation in Virginia, not to withdraw the force in the Chesapeake which he had called for, and which was about to sail for New York, but permitted Cornwallis to retain the whole — all with which he had been pursuing LaFayette and the large garrison at Portsmouth, a total of about seven thousand, rank and file. His new instructions, conveyed at the same time, were to the effect that his Lordship should abandon Portsmouth, which both generals agreed was too unhealthy for the troops, and fortify Old Point Comfort, where Fort Monroe now stands, as a naval station for the protection of the British shipping. In addition, if it appeared necessary, for the better security of the Point, to occupy Yorktown also, that was to be done. Obeying these instructions, Cornwallis ordered a survey of Old Point Comfort; but, upon the report of his engineers, was obliged to represent to Clinton that it was wholly unfit and inadequate for a naval station, as it afforded little protection for ships, and could not command the channel, on account of its great width. Then, following what he believed to be the spirit of his orders, Cornwallis, before hearing from Clinton, moved up to Yorktown, and began to fortify it in connection with Gloucester, on the opposite shore, as the best available naval station. Clinton made no subsequent objections, and there Cornwallis remained until his surrender. The Virginia State Quarter Coin shows against an artist’s view, circa 1870, of the surrender of Cornwallis’s men with Major General O’Hara, substituting for General Cornwallis, turning over his sword.